The success of the High Line has been seemingly ubiquitously heralded across mainstream media outlets, mainly because of the way in which it has improved the surrounding area, and the huge surge in property prices that border the park, some estimates put it at a $2bn increase. The decrease in crime in the area is obviously good news, but has it simply displaced it to another area? This argument of displacement is hardly new, but when you couple it with the celestially high jumps in property prices, it makes you wonder what has actually happened to all the people that used to rent and live in the area; have they had to move on with all the crime? The woes of gentrification are not, again, a recent debate in urban geographies, but given the recent tragic passing of Neil Smith (a personal, intellectually astute and hugely warming tribute by Tom Slater can be found here), those debates have perhaps been revisited and are made even more acute with the continual genuflection to the High Line as a means of ‘re-imaging’ our cities. Matthew Gandy wrote a while ago about how the High Line has ‘greened’ this gentrification rhetoric, and now, we hear (seemingly daily) of how city governments are looking to old derelict infrastructural sites as places to ‘upgrade’ and make them into innovate park-like, healthy or ‘green’ areas. The Lido Line in London, another High Line in Mexico City, even a bouncy bridge in Paris; the media is now awash with quirky ideas (often forwarded by third party planning consultancies or marketing companies) on how to improve the city just like the High Line did to New York City. Will they ‘work’ in the same way as the High Line? Maybe, maybe not. But it is not the point here. The serial replication of policy ideas as they move around the world from city to city leaves little room for discussions as to why the High Line is so popular in the first place. The reflexivity of localities do not seem to be taken into account at all. These ideas exist in a seemingly purely global arena, floating around the world looking for any city government brave (or perhaps stupid?) enough to take it on. A truly global space of policy flows. It can be related to, and situated in the context of the recent Jamie Peck-style critiques of the concepts of creativity and culture and their usage as ‘veneers’ of urban redevelopment policy. These ideas of culture and creativity (packaged as innovate urban spaces of leisure and play) are simply vehicles for, and the latest iteration of, urban redevelopment policies. The other (antithetically) related problem with the rampant proliferation of High Line-like escapades is that the money that is spent on (and indeed generated by) these initiatives could surely have better uses. The High Line in New York was developed through a community-based lobbying group with the use of minuscule funds, but a great deal of will. The income generated subsequently is what has gained it international revere. However, the duplication of the product is what has gone viral, rather than the process. City governments are asking “what can we build that will have the same effect?” and not “how can we encourage communities to act in the same way?” By building a Lido Line (if Boris ever did) for example, then I imagine it would cost a lot more than the High Line’s $50 million, but that’s not really the point either. I go back to the ‘re-imagining our cities for the 21st century’ line. Are the cities of the 21st century destined to be wonderful sites of amazingly innovate and interactive leisure activities? Or places were people, all people, can boast a decent quality of life? The two are not mutually exclusive at all, and I have often been an advocate of these initiatives – they can radically improve the quality of life for residents. But it’s the process of involvement that is critical. Planting a High Line in Mexico City without it being a community-orientated and desired project is, frankly a preposterous idea if the money can be spent on social services, crime reduction, housing, water treatment etc. By offering more fundamental provisions in the first place, perhaps city governments would empower citizens to act by themselves to create whatever Mexico City citizens’ version of a High Line would entail. It might not be the redevelopment of an derelict infrastructure into a park or any physically development/urban renewal of any kind at all; but it just might create enough will within a community to ‘spend’ some of the creativity they have on just trying to survive, on something that would benefit the city and thereby the lives of their own, and future generations. 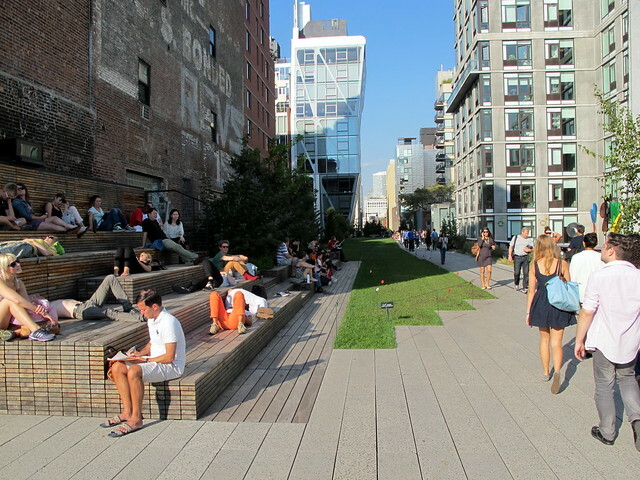 Let me be clear, this is not a critique of the High Line – I find it a pleasant, if crowded place. I also applaud the way in which it came into being – a community led process based on a desire to improve their part of the city. The gentrification it has caused is a process of the neoliberal public-private urban machine rather than a desired result of the community (I hope) and is symptomatic of a wider problem of urban governance in First World cities. It is the viral-like spread of the desire to replicate the end result (rather than a wider acceptance of the process and what it can achieve) that is a problem, and one that is an increasingly worrying function of the modern world city.